New Ramen Champs in Town! Ahhh, that familiar feeling of pushing a spoon down and seeing the rich, creamy umami broth swirl into my spoon. 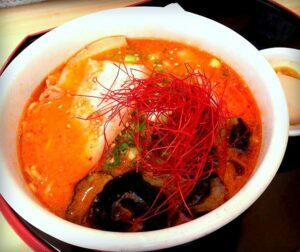 Can anything beat a nice hot bowl of Ramen on a cool, crisp Seattle day? Growing up in Asia, and traveling occasionally to Japan, I’ve always been on the hunt for good ramen. You can say that I’m rather picky when it comes to this Japanese dish. After moving to Seattle, I’ve tried many ramen joints, and these two new additions are definitely a must-try! My boyfriend and I stumbled across Hokkaido Ramen Santouka last winter in Bellevue, a quick 15-minute drive across Lake Washington from Seattle. There was a short wait of 20 minutes, but that’s always a good sign. The interior was chic and modern, unlike many traditionally decorated Japanese restaurants. We ordered the karaage (Japanese-style deep fried chicken) and the Tonkotsu Kara Miso Ramen with Aji-Tama (soft-boiled egg). Since we were sharing the ramen we also added the Shiyake Ikura Gohan, a rice bowl topped with grilled salmon and salmon roe. My go-to order is always the Tonkotsu ramen. The rich pork broth is our favorite, and what makes this one particularly good is the added kara miso for a spicy kick – yum! The noodles were a little chewy, just the way I like them. Accompanying our bowl was also cha-shu pork slices, bamboo shoots and kikurage mushrooms, all delectable added textures and flavors. 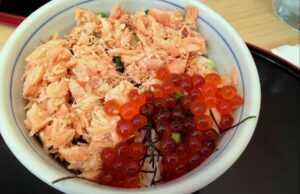 The full-bodied rice bowl had a nice balance of soft salmon and salty Ikura. They also offered a pork belly rice bowl we’d love to try next time! Our next champion is Kukai Ramen & Izakaya, newly opened with locations in Northgate, Capitol Hill, and Bellevue. I went to the Northgate location, a 15-minute drive through I-5 north from downtown Seattle. The restaurant was hidden in Thornton Place, opposite Regal Cinema. 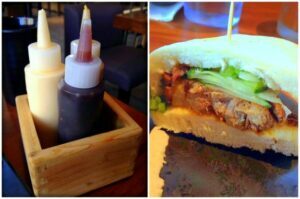 My friend referred us to this place and said we had to try their pork buns, and so we did! Quite similar to Ippudo’s famous buns (a global Japanese ramen franchise), these were soft, warm, and filled with porky goodness. They also served it with 3 sauces to add a little extra something if you wanted. I ordered the Hokkaido style Miso Ramen that came with lots of sweet corn, which I’m a huge fan of. My boyfriend, on the other hand, ordered the Garlic Tonkotsu Shoyu Ramen. He reasoned that since they made a limited quantity per day, it must be the ultimate dish – and of course, he was right! 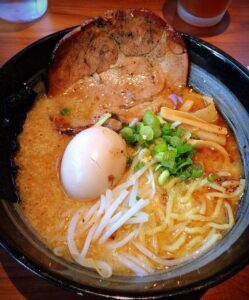 The rich pork-based broth was perfectly complimented with a bold garlic and shoyu accent. Not to mention, it came with a soft boiled egg for extra creaminess. This was definitely the clear winner! Since Kukai is an Izakaya restaurant, similar to a Japanese pub, they also offer many small non-ramen dishes good for sharing or eating companions who want to try something different. These include all sorts of appetizers and rice bowls. I will no doubt revisit these ramen joints to indulge my taste buds in the near future. There’s still so much to try! In the meantime, there are plenty of great places to get your ramen fixes right here in Seattle. Head over to the International District for the famous Tsukushinbo, or to Wallingford for Yoroshiku (also called 4649) and Miyabi 45th. Amy Tachasirinugune is a Sales & Marketing intern at Visit Seattle. Born and raised in Bangkok, she is now a student at the University of Washington. 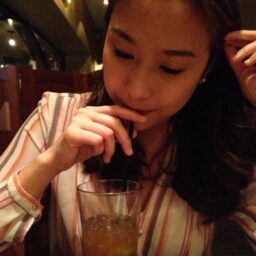 In her free time, Amy enjoys researching good eats around Seattle and embarking on eating adventures.